Why don't you get some massage at Supli Totsuka? 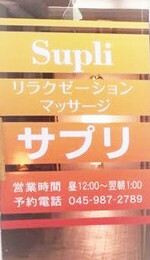 Now you can get FREE foot bath for all course at Supli relaxation massage in Totsuka. You can deeply relax and release all your tension taking your foot bath and with our Foot Massage or "足つぼ Ashi tsubo". Our Foot massage incorporates acupressure techniques. Those are well known for their ability to release muscular tension and promote the circulation of the body’s life force to aid in healing. for more information please check Ekiten HP or you can search "Supli Totsuka" on Google.